Interslavic zonal constructed language is an auxiliary language, which looks very similar to real spoken Slavic languages in Central and Eastern Europe and continues the tradition of the Old Church Slavonic language. 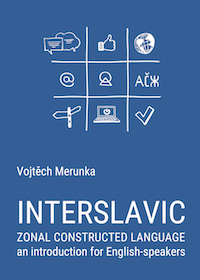 Interslavic shares grammar and common vocabulary with modern spoken Slavic languages in order to build a universal language tool that Slavic people can understand without any or with very minimal prior learning. It is an easily-learned language for those who want to use this language actively. Interslavic enables passive (e.g. receptive) understanding of the real Slavic languages. Non-Slavic people can use this language as the door to the big Slavic world. Zonal constructed languages are constructed languages made to facilitate communication between speakers of a certain group of closely related languages. They belong to the international auxiliary languages, but unlike languages like Esperanto and Volapük they are not intended to serve for the whole world, but merely for a limited linguistic or geographic area where they take advantage of the fact that the people of this area understand these languages without having to learn them in a difficult way. Zonal languages include the ancient Sanskirt, Old Church Slavonic, and Lingua Franca. Zonal design can be partially found also in modern languages such as contemporary Hebrew, Indonesian, and Swahili. Interslavic keyboard driver and fonts are for free download here.